There was a youth movement on day one of the Dixie Women’s Amateur as 13-year-old Elle Nachmann and 15-year-old Yujeong Son opened with 3-under 69’s to share the first round lead. The duo are part of just a group of six players that are under-par with three days still to play at Woodlands Country Club. In April Nachmann, then 12-years-old, turned some heads when she won the AJGA Amino Vital/Joey D Golf Junior Championship and became the youngest winner of a major AJGA event. Nachmann has also won a half dozen Junior Honda Classic’s and a trifecta of Doral Publix Junior titles. 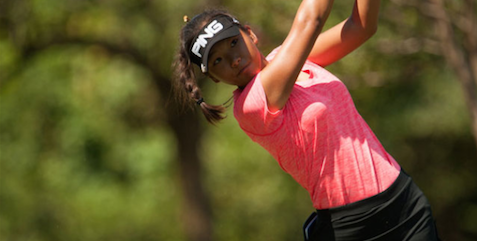 Co-leader Yujeong Son is one of the top junior players in the country and she is a two-time AJGA All-American. In 2016 she reached the semifinals of the U.S. Girls’ Junior Championship and earned three top-10 finishes in AJGA events. Wenyan Ma is in third place after a 2-under 70 while Emma Albrecht (Notre Dame), Aline Krauter and Mika Liu (Stanford commit) are tied for fourth at 1-under. Monday play was contested on the West Course with play now set to switch to the East Course at the Woodlands Country Club for Tuesday. A cut will be made after the third round.